Fantastic pic that I, for one, have never seen before! Anyone know what the occasion is? I've seen it but only for the first time several years ago. Is he leaving a radio (or television station), possibly in Los Angeles to promote Walls And Bridges? (MarkZapp? Is that not KHJ radio station on Melrose in Hollywood? Guess when John played DJ for the day. Forgot to show up at this very special event. Know of one friend who got John's autograph and another spoke to him when he arrived early in the morning. Looks like Tony King on the far right. Hi friend Skip! Yes that is when John was at KHJ in Hollywood for the day with May Pang. 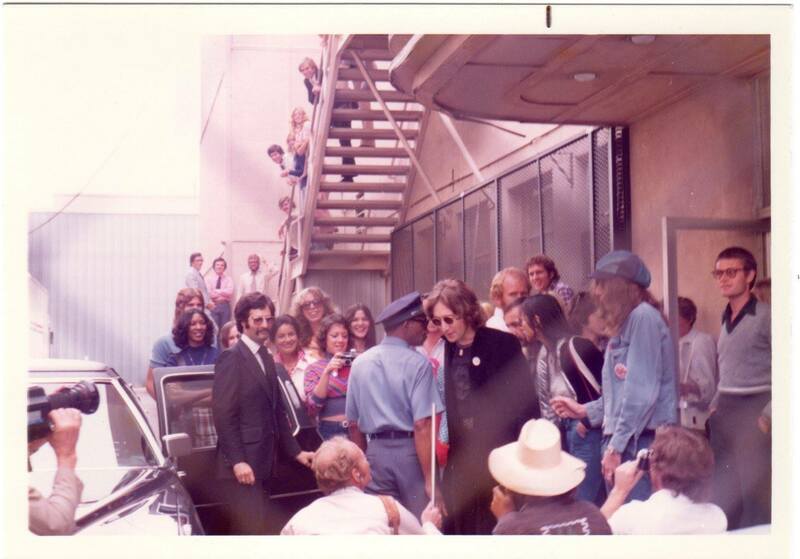 Once John hit the air, a lot of fans made their way to the station. Too bad you missed out!